Pork Dumplings with Curry – see how none of the curry sauce clings to the wonton. The Upper West Side of Manhattan is experiencing a Chinese food renaissance and the dumpling competition has become fierce. Jacob’s Pickle has a great reputation for pickles and built upon that reputation by opening Maison Pickle. With the new Lucky Pickle they have expanded into the local dumpling scene, unfortunately their dumpling game is no where near as strong as their pickle game. It also turns out their noodle game isn’t as strong as their pickle game. The Cold Noodles in Sesame Sauce was meh tasting, the noodles had the texture of store bought dried spaghetti and the sauce was thin and watery. All the online articles and press describe Lucky Pickle’s menu as being inspired by the owner’s experiences eating street food in Hong Kong but somehow that experience got watered way down in its translation to the Upper West Side. 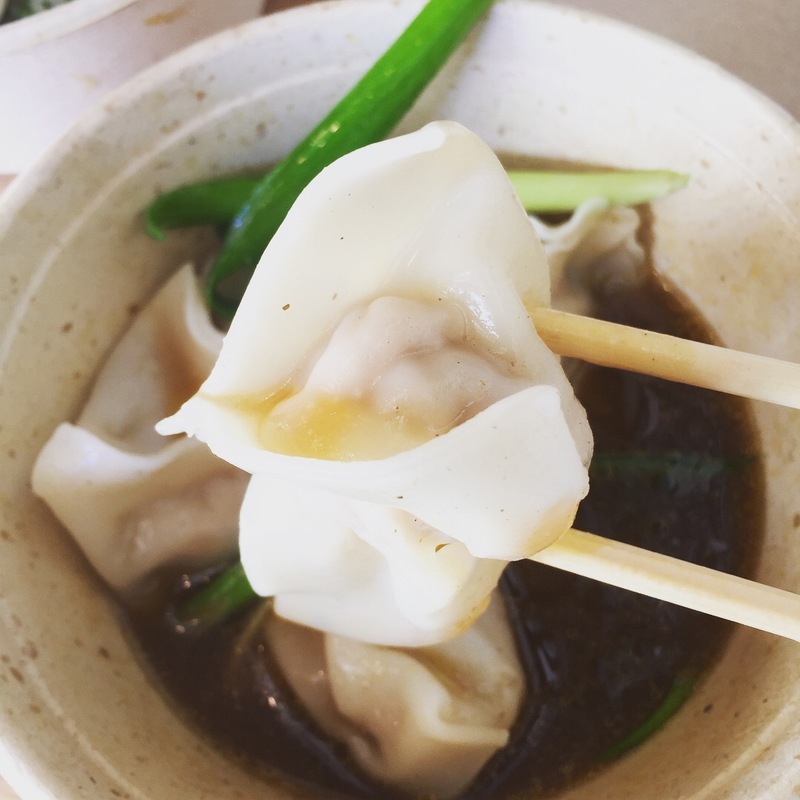 A dozen places selling way better noodles and dumplings can be found less than a mile north and great dim sum can be found six blocks south of Lucky Pickle. Lucky Pickle has shared table seating for about 15 people and you order and pay via wall mounted touch screens. Eating food right after touching a screen that 1,000s of other people have touched has a certain gross factor for me. The other weird thing about the experience is that despite the small foot print and automated ordering and paying, I counted six employees hanging around the tiny space. 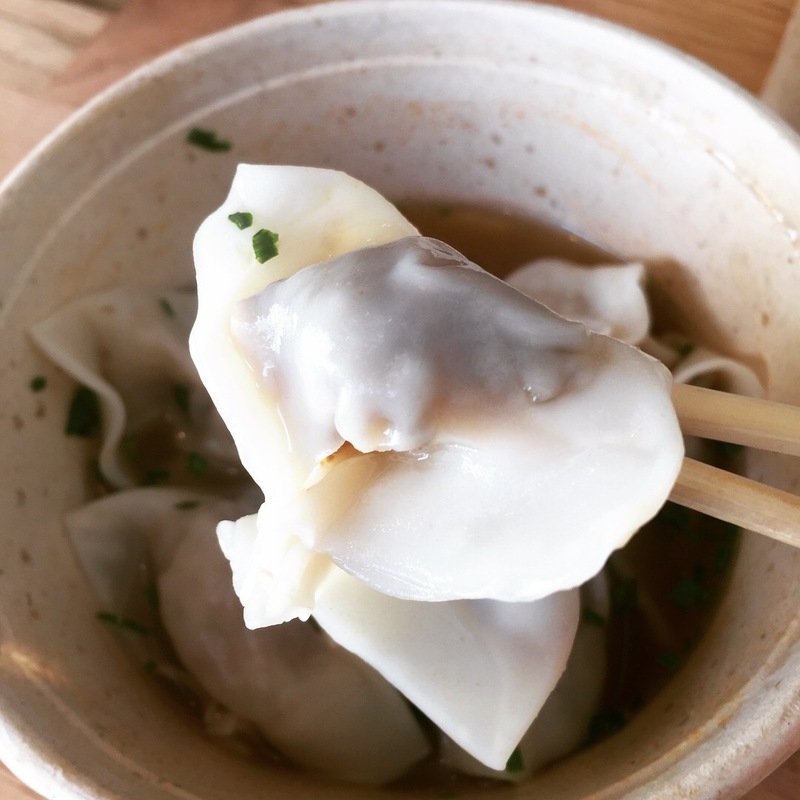 The Dumplings: Lucky Pickle serves Vegan dumplings in vegetable consomme, Chicken dumplings in countryside broth, Pork dumplings in 5 spice broth, Shrimp and Pork dumplings in 5 spice broth and Shrimp dumplings in ginger butter sauce. It appears that all their dumplings are actually wontons served in a cardboard tub of broth. One thing I did like about Lucky Pickle was that their menu is very clear in indicating which items are vegan (Vegan dumplings, Cold Sesame Noodles, The Lucky Pickle, and the Steamed Spinach). Vegan dumplings with consomme – these wontons were served sitting in a decent tasting, but murky looking vegetable broth. This dish is clearly misnamed, consomme is supposed to be a light, clear broth that has been clarified to remove fat and sediment, this soup was not that. The wontons were stuffed with finely chopped, unidentifiable veggies that lacked any real flavor or texture. The wontons were over cooked and the very thin wrappers began to tear as soon as I touched them with the chopsticks. Curry Pork Dumplings – these wontons were served in a thin, watery “curry” sauce that lacked any real curry flavor and just had a modest spice heat from some chili oil in the sauce. Thankfully the pork wontons were not overcooked like the veggie ones, but they were close to flavorless and had no appreciable seasoning. The wontons were garnished with green scallion stalks which was the most flavorful element of the dish. 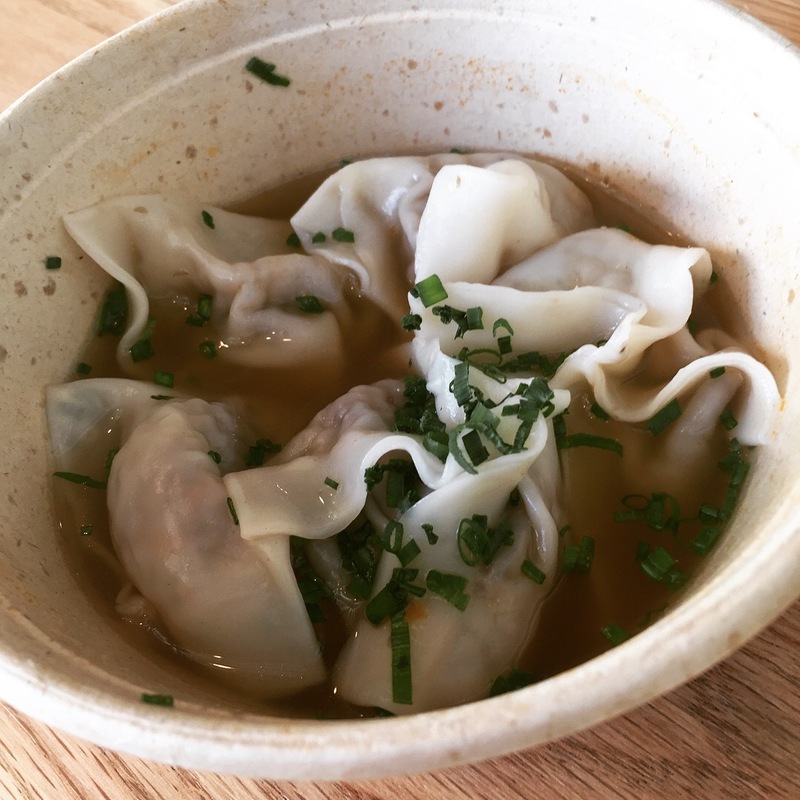 Dipping Sauce: Lucky Pickle focuses on wontons served in broth, so there are no side dipping sauces. With two of the three dishes I tried the sauces and broths were really thin and watery. The Location: Lucky Pickle is on Amsterdam Avenue between 84th and 85th streets in Manhattan’s Upper West Side neighborhood. This is the home base of the Jacob Pickle mini-empire, Jacob Pickle is 2 doors down the avenue and Maison Pickle is a five minute walk away. But the Upper West Side is experiencing a Chinese food renaissance and the dumpling competition is fierce, there are more than a dozen places within a mile of Lucky Pickle that are producing better dumplings. This entry was posted in New York City, Pork, Soup, Vegetarian, Veggie Dumplings, Wontons. Bookmark the permalink.